Food served Mon–Fri noon–2pm, 5–10.30pm; Sat noon–4pm, 5–10:30pm. Closed Sun. This Haymarket stalwart continues to deliver creative seasonal dishes at affordable prices. 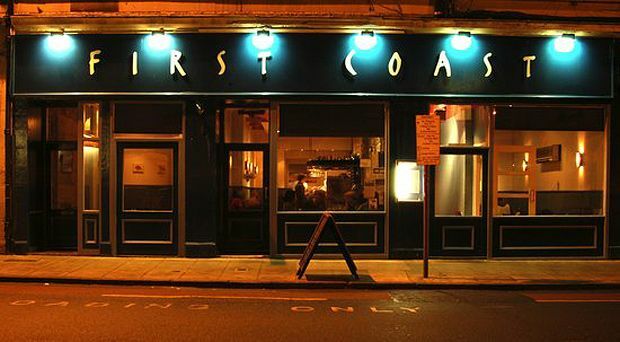 Plucky little First Coast has held its own against an explosion of restaurants on Dalry Road for over 16 years now. It's easy to see why – in Hector Macrae they have an ambitious, creative chef who is excited about creating bespoke dishes built around solid local sourcing and seasonal ingredients. Starters like beef rendang reach well beyond the average, featuring tiny coconut infused meatballs rolled in coriander, star anise and shrimp paste with lime leaves and lemongrass adding an aromatic kick. A main of chargrilled chicken is elevated with expert touches like caponata, a brash and warming aubergine stew, while venison haunch comes rare and juicy, steeped in beetroot and artichoke purée and bolstered by a deep, dark raisin and prune gravy. Puddings are enchanting: a light and fragrant ginger nut parfait laced with lime caramel and tiny biscuit crumbs is a particular belter. It’s all served up in a modest interior with a stripped stone wall, where a cosy bar and roaring fire set a relaxed, easy vibe – as does a nicely priced wine list featuring natural wines and special malts. From wee neighbourhood suppers to big shiny nights out, Edinburgh's bistros and brasseries are ever-evolving. Their sheer variety means you can expect everything from innovative dishes to old-time classics, from long-time institutions to new favourites. The List's annual Eating & Drinking Guide, published on 18 April 2018 with coverage of almost 1000 food and drink venues across Edinburgh and Glasgow, has announced the winners of its reformatted Eating & Drinking Awards for 2018.